After play-testing the Donnay Pro One 97 Pentacore, which had a nice and flexible response, I was really keen to test the Hexacore edition. I was not disappointed. Read more in the Donnay Pro One 97 Hexacore racquet review. Donnay used to be the racquet choice of Bjorn Borg, but has since been more of a “background company” on the tennis scene. They have always produced high-quality products and in a time of tennis racquets becoming stiffer, they have decided to focus on arm-friendliness. A sensible option for a tennis nerd. 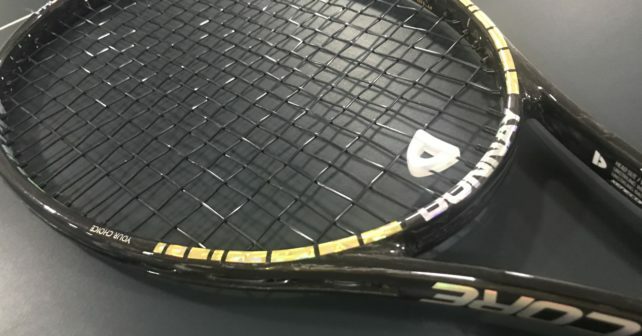 This Donnay Pro One 97 Hexacore racquet review will tell you that they have done a good job, but that the lack of power in the frame might not be everyone’s cup of tea. Donnay mentions HEAD’s legendary PT57A pro stock racquet (based on the Pro Tour 630) in their description. It seems strange mentioning another brand’s racquet in your advertising. However, HEAD has never re-issued that racquet and several brands have tried to reap the benefits by copying that design and mold. Tecnifibre did it really well with the Tfight 315 Ltd , Wilson is relatively close with the Wilson Ultra Tour, etc. But does the Donnay Pro One 97 Hexacore play close to the legendary PT57A? The specs of the Donnay Pro One 97 Hexacore are taken straight from the official Donnay tennis website. As you can see, the swing weight is low and the RA is below 60, meaning this racquet does not provide a lot of power. Playing it in stock form will make you feel like the life is sucked out of your shots and you really need to swing for the fences. This racquet definitely is plush and on touch shots it delivers in spades. But for players who need a bit of extra help with power, it might not be your best bet. I tried it with various lead setups. If you do not like to add a lot of weight and lead tape to your racquet, I suggest 2-4 grams at 12 o’clock. 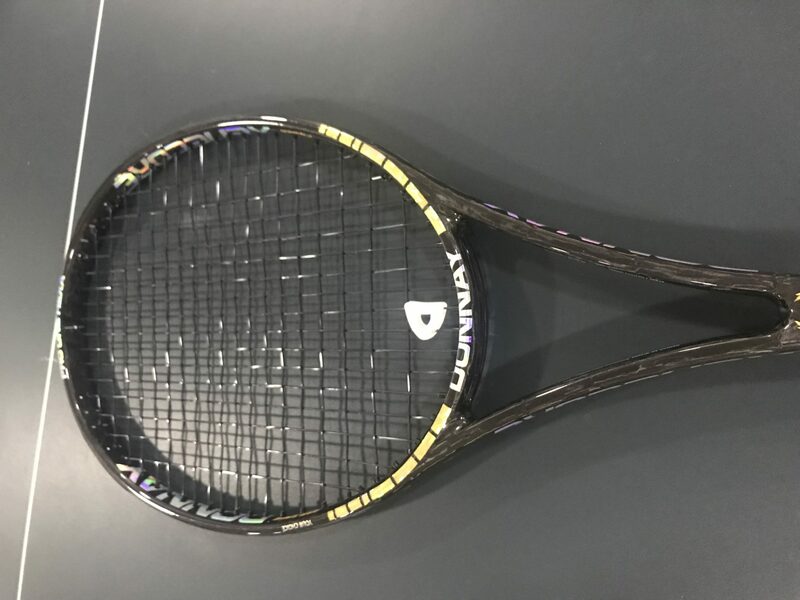 But I do not mind a heavy racquet and ended up getting my Donnay Pro One 97 Hexa up to 353 grams, and a 32 cm balance (incl lead tape, strings, dampener, overgrip and a leather grip instead of the original). It really plays nice in this form, but if you compare it to a RF97 Autograph, there is still a lack of power. This can be mitigated with a different string setup, like for example a hybrid such as a Champions Choice that Federer uses. The feel of the Donnay Pro One 97 Hexacore is very nice. You get pinpoint control yet decent spin from the 16×19 string pattern. However, the power level is low and something to keep in mind if you are used to crisper racquets. If you are playing the PT57A or similar racquets already and want something with similar flex but a slightly bigger sweet spot, this racquet could suit you well. Comfort is what Donnay says they focus on and they get the highest marks here. Not even a harsh poly would create issues for the arm with this stick. I used it with MSV Focus Hex and it played soft. I think a spinnier poly string such as Solinco Hyper-G or Luxilon Alu Power Rough could work well in this racquet. If I would recommend something it would be a hybrid with poly in the crosses and something more powerful in the mains. With the buttery response of the racquet, a setup like that could be heavenly to players who enjoy flexible racquets. I did not play my best tennis with this racquet. 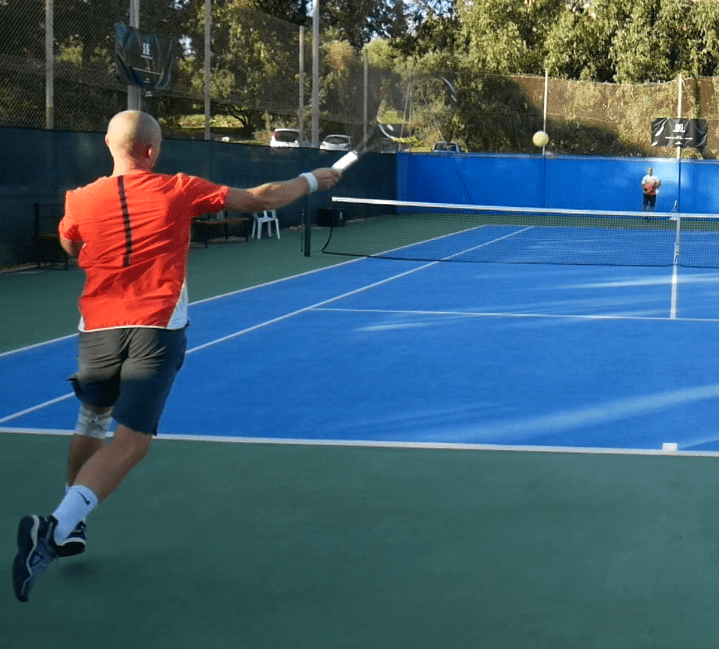 It is simply a bit too flexible for me and I feel that my flatter shots do not really penetrate the courts like they do with my Radicals or the recently tested Yonex VCORE 95 (read my review here). I definitely like a bit more zing on my shots to be able to be effective. Drop shots and touch volleys I could hit all day with this stick and I also enjoyed serving with it, but that final put-away shot was not there for me. The Donnay Pro One 97 Hexacore is something so rare as a new racquet with a stiffness rating below 60. It offers great control and touch, but requires you to be a skilled player to utilize it to its fullest potential. My Norwegian friend and hitting partner, Karl, who occasionally plays on the ITF tour loves this stick, but he has the kind of game for it. Anyone who values a little free power should probably look elsewhere, but players with arm-issues who like to caress the ball into the corners for a winner will love the feel of this racquet. It really is an old-school frame released into a market where power and spin are the biggest selling points. A daring move by Donnay that I applaud. I hope more people will venture into the flexible racquet territory. It might not be as alluring as power and spin, but it sure helps to develop solid technique and feel and will save your arm from injuries down the line. If you are looking to buy a Donnay racquet in Europe and don’t want to go through the official website, you can check out Racket1 in Norway. They were nice enough to provide me with my demo racquet. What do you think of the Donnay Pro One 97 Hexacore? Is it something you would like to try? Please comment below! How would you compare the feel of the racquet to the VCore 95 and the Angell K7. The yonex in my opinion is relatively plush but still too firm/crisp for me (modern feel), you mentioned similar impressions in your review. The K7 string pattern on the other side was way too open and only useable with poly. How is the launch angle of the Pro 1 Hexcore in comparison, since the string pattern looks also fairly open. The VCORE is crisper and faster through the air. The Angell K7 has a quite similar feel from the string bed, but a more open string pattern (a bit too open at times). The launch angle on the Pro One is quite controlled – definitely lower than the K7. Might be a good option for you! How does this stick compares to the xt prestige pro when talking about sweet spot and power? So what is your take away compared to the PT57A? Do you feel that it plays similar? I use the PT630 and the Candycane as my main sticks, so it would be interesting to hear what you have to say. Light, even balanced, low SW. This looks like a platform racquet, like the Ultra Tour from Wilson. It’s built to be customized to a players preference. RA @ 57 is pro stock level, it’s what can be found on H19 and H22 from Wilson. This one I would love to take for a hit. 21 mm makes it a very thin beam frame, which I love, if it’s box shaped like the old pro staffs, it would be perfect for my liking. Thank you, this is a brand I don’t pay much attention, but they have been doing a great job on building niche racquets. Donnay have released an even more flexible frame called the “Allwood”, which would be interesting for you to test. It has an RA of just 50. Btw have you tried the PK Q Plus tour 325. It’s a very solid and comfortable frame, one of most underrated as well. I wonder this racquet is similar to penta core 97? Which one is the lastest tech? What is the difference between penta core and this xenacore ? I am confused….. Yes, it is similar, but this is the newer version with a bit better feel and a more even response from the string bed. The lines from Donnay are Tri-core, Quad-core, Penta-core and now Hexa-core. They try to improve feel and comfort with each line. The technology in all racquets is called Xenecore which is supposed to mimic the feel of wood. Good question. I don’t know, but it sure feels like 57 strung. Unstrung would mean it is 54 strung which would be noodle-like. I saw this and became motivated to buy a Donnay racket myself. I chose the X Dual Gold 99. Do you know anything on this stick? Will actually review the X Dual Silver 99 in a near future. It is the slightly lighter version…Mats Wilander actually uses it these days. I will actually get an Allwood in a week or two for review. Really curious how it feels. I have not tried the PK Q Plus Tour 325 but heard that it is good. ProKennex arm-friendly tech actually seems work well. Hi, yes, very arm-friendly and very powerful! I mention it in my latest Tennisnerd Talks that is up on the YouTube channel. I prefer the Donnay Formula 100 Hexacore though. That is a very good racquet. Which is your preference for Pro One 97 Penta or Pro One 97 Hex? Both of these two rackets have the same RA but is there a difference in power? Pro One 97 Penta and Pro One 97 Hex are the same RA, but which one has power? And which one is your favorite? I think they are both quite low powered and prefer the Donnay Formula 100 Hexacore. But my favorite of the two is the Penta and that has a bit more power! The Penta should have a slightly higher stiffness rating and more power. I prefer that one.